NGC 7217 in Andromeda is an unbarred resonance ring spiral galaxy. It has recently been discovered that a significant number of the stars in the galaxy are counter-rotating, and it also has a large, but very faint circular halo of stars surrounding it. This halo is much too faint to be seen well here though. The outer ring has most of the H1 gas in it, and is full of new blue stars. It's quite bright visually at magnitude 10.1, but this is just the core. The outer rings are very faint, and it was quite a tough job to capture and process these without blowing the stars or the core out. It lies at a distance of 50 million light years in Pegasus. Imaged with a TMB152 @ F8 between the 11th and 16th October. 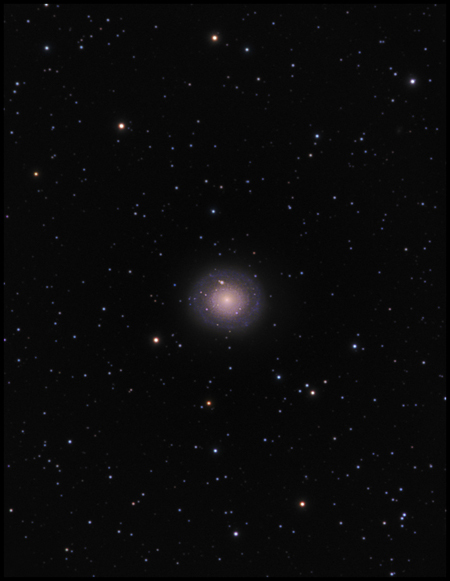 Luminance data was captured with an SXVF H16 and used for the galaxy only. I also shot over 5 hours of RGB with the H16, but found it to be lacking in colour so I shot another 4 hours with an Atik 16HR, and this has been used for colour in the galaxy, and for the starfield. The SXV colour data wasn't used. I was amazed just how much more sensitive the 16HR was, using the same scope/filter combination. Red. 9 x 5 minutes, 3 x 6 minutes. Green. 7 x 6 minutes, 3 x 8 minutes. Blue. 8 x 8 minutes, 3 x 10 minutes. Total. 10 hrs 5 minutes.